Really nice deck dude. How do you perform with it ? My 2CP is that you got a bit too high curve for the format. Especially since just like me you play green without the dorks. First -> go to 37 lands at least (!!!). Seriously, appart Akira/Silas, some special Sram decks or Mono red decks, competitive decks with less than 35/36 lands don't exist. Lower your curve a lot or add all the dorks. I ran Lost in the Woods in an earlier rendition of the deck and dropped it due to the inconsistency and constantly losing good cards to the bottom of my library. I'm considering doing a build with Dosan the Falling Leaf , so Spike Weaver and Fade into Antiquity could definitely find spots. Night Soil is interesting and I might play around with it. 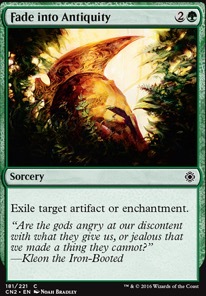 The upside to Scavenging Ooze is the potential lifegain and it can target noncreature cards. We have a Bruna deck that runs rampant some games and taking out a crap ton of enchantments out of that graveyard has been awesome. Predator, Flagship is kinda neat, but really mana intensive, so I doubt it'll find a home here. I do like Arena and will playtest it though. Thanks for the suggestions! Love khamal. best wrath insurance green can buy. "I cast Wrath of God !" 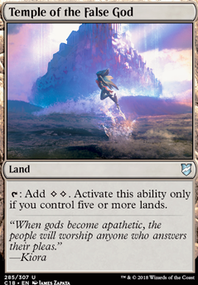 "I animate all your lands." "one sided Armagedon isn't too funny, is it?" Night Soil exiles as part of the cost, meaning that the creature removal cannot be responded to. 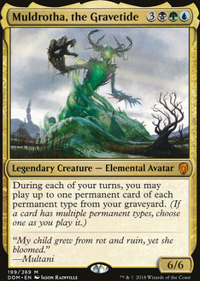 There's only 10 creatures that benefit fully from the cost reduction on Urza's Incubator, assuming you choose Elf. That's not even half of your creatures. I think you'd be better off with Herald's Horn. Swap Fade into Antiquity for Nature's Claim or Krosan Grip. Swap Scour from Existence for Beast Within. 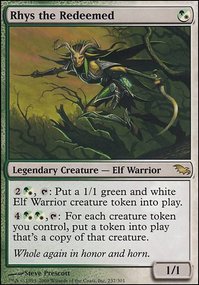 Swap Wellwisher for Arbor Elf. Life gain isn't so good in EDH. Swap Steely Resolve for Eladamri, Lord of Leaves. Swap Heedless One for Argothian Elder. Put in Maze of Ith to combo with Argothian Elder. Swap with Autumn's Veil or Hunting Triad. Swap Wirewood Hivemaster for Fyndhorn Elves. 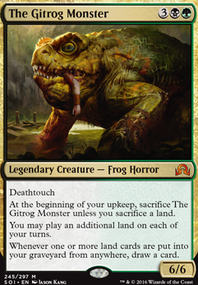 You might also want to consider putting in Green Sun's Zenith and Worldly Tutor to pick out the creatures you need. Also, Concordant Crossroads to be able to attack right away once you've assembled your combo. 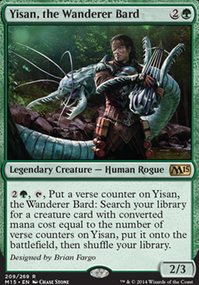 Selvala, Heart of the Wilds and Viridian Joiner have tap effects similar to Marwyn's, so they are probably worth including. I like Krosan Grip a lot and the only reason it isn't here is because I don't have a copy! For now Fade into Antiquity works and I like the exile effect. I've never heard of Hell's Caretaker before. I think it'll be an instant add if i get a copy. great suggestion. The two land cards are excellent as well. I've been using Polluted Dead and Acidic Slime for similar effects, but I've never considered having the ability on a land before. The first changes are because I personally think instant speed interaction is better than it being limited to your turn. 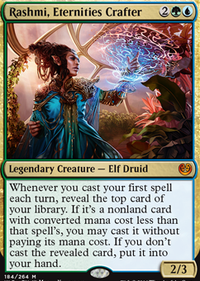 Second is because Path of Ancestry is strictly better even though it only helps with one creature. Third is because I think Theft of Dreams will be more useful overall. Fourth changes are to implement a new combo with Cloud of Faeries: use the same combo as Drake but if you have two of those enchantments or one with Simic Growth Chamber it will produce unlimited mana. Besides that, I would maybe find a way to work in Mystic Remora. For beats you could add Executioner's Hood. I'll think about it some more.